The shift toward radial tires, which use a higher percentage of natural rubber than bias-ply tires, has resulted in an increase in natural rubber consumption over the past 35 years. Between 1975 and 2008, natural rubber’s share of the total rubber market has increased. There have also been diverse government incentives to help develop the downstream rubber processing industry in Southeast Asia. As a result, natural rubber consumption has trended upward in these countries but the majority of production is still exported. 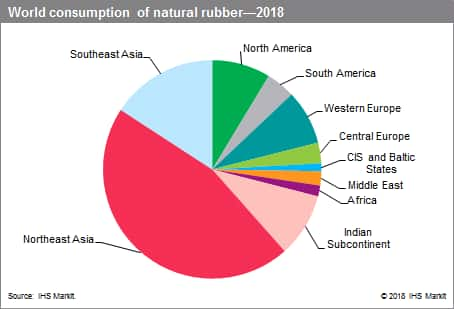 The increased rubber consumption in the natural rubber–producing countries has been one factor, as well as the greatly increasing demand for natural rubber in China and India. Overall, tire production and tire weight greatly influence natural rubber demand. Tires and tire products accounted for 70% of the total consumption of natural rubber in 2018. General rubber product uses include automotive and mechanical parts, medical and health-related products, and nonautomotive mechanical parts, which collectively account for the remaining 30% of natural rubber consumption. These shares are not expected to change in the next five years. Natural rubber prices jumped to new all-time highs in 2011 because of supply fears from the major producing regions in Asia. From 2012, natural rubber prices fell sharply owing to a surplus of natural rubber, along with a weakness in tire demand. The market situation was in something of a transition in 2014 and 2015 as natural rubber oversupply pushed prices further down. For much of 2014, natural rubber was able to capture low-end volume from synthetic rubber,especially in Asia. However, synthetic rubber prices also fell because of the significant drop in crude oil prices in late 2014. As a result, synthetic rubber regained some of its lost market share. A significant majority of natural rubber production comes from small farmers that are not able to reduce production when prices fall to try to tighten supply and push prices higher. As a result, falling price trends draw strength from rising inventories, making the situation that much worse for producers. Natural rubber is a naturally occurring elastomeric polymer of isoprene (2-methyl-1,3-butadiene) with excellent resistance to abrasion, impact, tears, and heat buildup caused by hysteresis. It is also characterized by very good tensile strength, green strength, resilience, flexibility, aging stability, and building tack. However, natural rubber is not very resistant to oxidation, ozone, weathering, and a wide range of chemicals and solvents. Thousands of species of trees, plants, shrubs, and vines produce natural rubber latex in the world. Although natural rubber can be isolated from nearly 2,000 species of trees, plants, shrubs, or vines of the tropical and temperate regions, one source—the tree Hevea brasiliensis—provides essentially all (99.5%) of the world’s natural rubber. Hevea rubber is produced in tropical areas of the world including the equatorial areas of Southeast Asia, Africa, and Central and South America, but not in the United States, Japan, or Europe because of unsuitable climatic/weather conditions. A small commercial source of natural rubber, the guayule shrub, Parthenium argentatum, has been of interest because guayule rubber can be produced in hot, arid areas, such as the southwestern region of the United States. Because of natural rubber’s large consumption volume, the limited area of commercial production, and its importance to the world today, the management of its supply is of dire importance. This includes two major areas—stabilizing the current supply of natural rubber and developing diversified sources of natural rubber. World consumption of natural rubber is forecast to grow at an average annual rate of about 3%.